Two storey villa, front line sleeps 6 A/C. One of only a few properties in this beautiful location with the villa being front line to the sea. The villa sleeps 6 people. There is a good sized covered terrace 2.5 x 7m area overlooking the sea and mountains. Big enough for sunbathing, lazing around or for alfresco dining. The sunset is not to be missed can be seen from this property and is amazing (Set on the west side of the tramuntana mountain range). The ground floor consists of a Single bedroom with a walk in closet with a door leading to the full family bathroom. Also a door leading to the bathroom via the lounge area, with sea and mountain views. There is a Lounge / dining area with satellite TV and DVD with 3 sofas and chairs, which Leads through to a small court yard area with table and chairs which then leads to the separate fully fitted kitchen. The kitchen is well equipped with all electrical appliances, including dishwasher and washing machine and small table and chairs. Second floor consists of 1 x single bedroom. 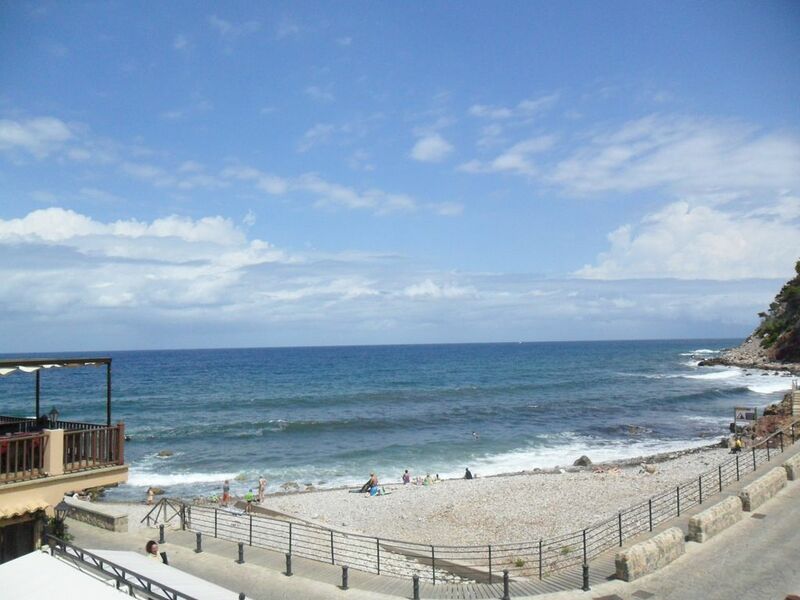 Two Double bedrooms both with sea / mountain views and one full bathroom. Outside at the front of the property there is private car parking for this villa. A magnificent away from it all property. The villa is in the port of Valldemossa by the sea so is at Sea level. The drive down from Valldemossa village is via a windy road. Walking/Cycling/Climbing: Walking and cycling are very popular here in Valldemossa and also all over the island. Walking routes are available from the local information centre in Valldemossa village and all walks are very well signposted. Canyoning is also available and is a relatively new sport that involves walking, scrambling, climbing, jumping, abseiling and/or swimming through a canyon. Due to the limestone rocks found in the Tramuntana mountain range, Mallorca boasts many canyons that have been carved out over millions of years by water. These narrow gorges, with beautifully sculpted walls and waterfalls provide a striking setting for this all-action activity. Guided kayaking excursion, starting and finishing from the Playa d'en Tepic beach in Puerto Soller. Mountainering where you often see groups as you enter/leave the port of Valldemossa. Snorkelling in the port is popular also. History of the village: In 1838 Frederic Chopin and George Sand visited the island and stayed at the Royal Monastery in Valldemossa, both left a mark on Mallorca and Valldemossa that is set in the foothills of the Tramuntana Mountain range. The island beautiful scenery captivated both of them Chopin said, '... I shall live in a wonderful cloister in the most beautiful part of the world...', and his companion thought, 'Anything that can be dreamt by the painter or the poet has been created by nature in this place. Today the grounds of the Royal Monastery of Valldemossa are open for visits to the many different chambers it contains. In August the village holds the Chopin festival which dates back to 1930 this takes place in the Monastery's cloister. The Royal Monastery of Valldemossa has its origins in the early fourteenth-century palace constructed by King James II for its son Sancho, which was donated to the Order of San Bruno in 1399. A camera is essential in Valldemossa. Lovely big terrace plenty of room for dining whilst overlooking the Mediterranean. The villa wasperfect, has everything we needed for a wonderful stay. The location is breathtaking and the villa is in the perfect position right across from the beach, a car is a must and the drive down the mountain was an experience. We swam every day in the wonderful warm sea, there is only one restaurant/bar which is great as it became very peaceful at night, the villa is in the perfect location to see the sunset. All in all a beautiful place and the town of Valldemossa is gorgeous for a lovely lunch and walk around the cobbled streets, very nice. Thank you for your lovely comments. This always helps other potential guests. this is a rare find,dont tell everyone.my only suggestion would be a couple of beach chairs or mats,it is a pebble beach. We stayed in this house by the beach in Port de Valldemossa in August 2015. Had a blast. Everything you need is provided for. Check in process was smooth, checkout was smoother. You must have a car to get back and forth, I believe. The winding road up and down the mountain from the house was one of my personal favorite parts about the trip. I will absolutely return. We had a lovely stay in the villa in Port de Valldemosa. We had an extremely wonderful welcome from Magdelena when we collected our keys with some very helpful tips on how to get to the villa and what to expect. The villa was very beautiful and very comfortable for our party of 5. Magdelena was also extremely helpful with some enquiries we had which made our holiday even more relaxing. We felt we were in good hands with the owners, we had a good relationship with them and felt very welcome in the Villa as well as in Mallorca. This beautiful beach front -Front line property with only a few other houses in this stunning area with breath taking views of the sea and mountain. If you are looking for a fun packed or action packed holiday then this is for you, you are surrounded by lots of interesting activities depending on your choice. Walking, rock climbing, snorkelling, Or if you are looking for a relaxing holiday then this could also be it! Laze around in this beautiful port or on the large terrace listening to the soothing noise of the sea. Or you can be out and about taking the scenic drive out of the port to Valldemossa town (where you will find all amenities) / Deia / Soller which are all close by or on to Palma which is only a 25 min drive away. By the villa is a lovely restaurant well known for its fish dishes, eating inside or on the many terraces overlooking the sea watching the sun set! Alfresco dining by the sea......One of Mallorca's unspoilt coast lines.